Holly Bidle and her former husband Jim Reed fell in love with the house on Mt. Zion Road in Golden the minute they learned about the mine entrance from the house’s laundry room. Never mind the building’s peeling paint, the rusting elevator in the yard, or the creepy trophy mounts that covered the walls of almost every room. The mine’s history proved irresistible to Holly and Jim, who were themselves innovators in the field of mining technology. In 1983 they founded RockWare, which developed one of the first commercially viable software packages for geological modeling. By 1990, when they bought the Mt. Zion house, their flagship product (RockWorks) was beginning to emerge as an industry standard for mineral and petroleum exploration. Rolf Rohwer, ’50, is the envy of all Miners, for he can boast of having his own private mine tunnel connected directly to his house. . . . The Rohwers built their home at the entrance of the old school mine which was used by Colorado School of Mines mining students before the Experimental Mine was established in Idaho Springs. Holly and Jim may have elicited more sympathy than envy when they took possession of the rundown building in 1990. They gradually made the house livable, while fixing up the mine tunnel with new lighting, decorations, and artifact displays, and their two young sons enjoyed the coolest playhouse and hideaway any kids could ask for. “We had most of their birthday parties back in the mine,” Bidle says. 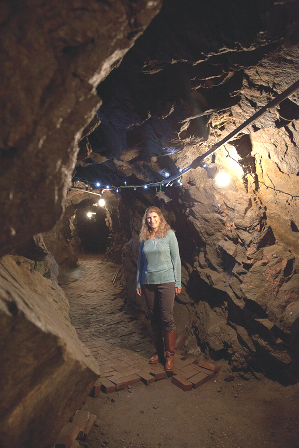 “They’d have all their friends over, we’d lay down a tarp, and they’d roll out their sleeping bags and sleep over—right there in the mine.” Holly also extended an annual invitation to her kids’ school classes, from kindergarten through high school, for field trips in the mine. A few years ago, with her boys grown and the house largely vacant, Bidle began renting out spare rooms to Mines students from overseas through a service called Interlink. That led to her decision in 2014 to open her home to tourists. She listed her home on the online booking service Airbnb, becoming the only property in the company’s vast database that includes a mine tour as an amenity. Bidle personally guides each guest through the mine, eliciting responses that vary from delight to curiosity to mild phobia. She points out the tunnel’s ventilation tube and drainage features; a collection of safety gear (not vintage) that includes hard hats, lanterns, and utility belts; and a wooden beer barrel from the Coors Brewery. Visitors also get a quick primer on early 20th century mining as she points out drill holes, anchor points, and other features of the instructional mine. Guests from as far away as Denmark and China have booked a stay in Bidle’s home and toured the old instructional mine. Each time she opens the laundry room door to reveal the dark tunnel beyond, she enjoys a brief flash of her own excitement the first time she saw the house back in 1990.